(17th March 2006) ERUPTION SHOCKS RAOUL, KILLS FOUR, RUINS WATER SUPPLY. Raoul's ever-rumbling volcano erupted again today, at shortly after 8 a.m. It is the first major eruption since the serious 1964 one. Four people are reported lost: one foreigner (a New Zealand technician), and three slaves who were on labour detail near the lake. The Green Lake crater burst out with the short eruption, and the polluted water ran into the fresh water supply at Blue Lake. This has caused the public water supply to be contaminated and turned off. All citizens are urged to conserve water and not turn on taps at all, as the outflow from taps is very acidic and if used from showers for instance will cause chemical burns. The government is taking urgent steps to import water from nearby islands. 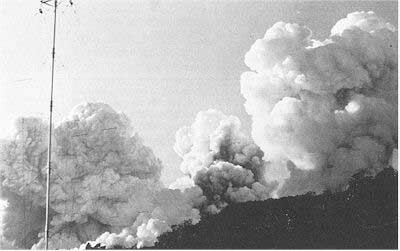 Photo of the 1964 eruption. (21st May 2001) C. G. MURGATROYD'S DEATH SHOCKS RAOUL. Envoy Murgatroyd, widely respected as the genius behind Raoul's rise from obscurity, died today. The popular crusader became Special Envoy to Mistress Aveline, and travelled the world, where he met many Fifth World leaders and was acclaimed by the ICIS for his diplomacy and peacemaking. Tributes are rolling in from around the world, and Mistress Aveline has decreed a public day of mourning to be observed tomorrow, 22nd May. The funeral will take place on Friday. More about Murgatroyd. 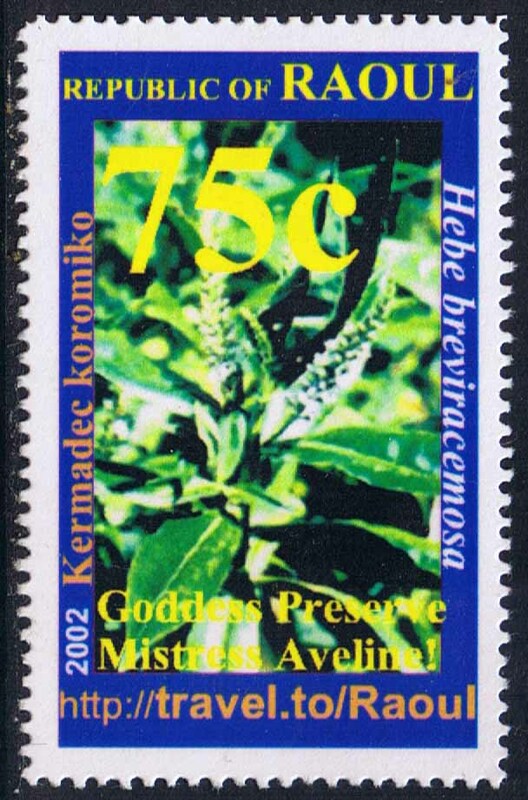 (8th June 2002) RARE PLANT HONORED ON NEW RAOUL STAMP. 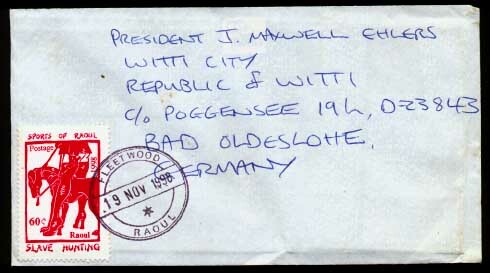 (26th September 1998) STAMPS NOW BOTTOM LEFT IN RAOUL. In accordance with the desires of Mistress Aveline, Absolute Ruler, President-for-Life, and Supreme Commander, the Raoul Post Office has created a new regulation. All stamps on Raoul mail are to be placed on the bottom left hand corner of envelopes, instead of the traditional top right. This will show the world that we will no longer be happy to follow their standards just to keep up with tradition. Please make sure that this information is passed on to the slaves that handle the correspondence for each household. (22nd September 1998) RAOUL JOLTED. Raoul citizens had a surprise awakening when a tremor shook houses and dungeons, and caused some crockery to smash today at 5.17 a.m.
"The earthquake measured 4.6 on the internationally-recognised Richter scale, and had its epicentre 67 kilometres west nor'west of Raoul," said Madam Bettina, director of the seismological bureau in Fleetwood's ritzy Amelia Earhardt Drive. To view the stamp featuring Madam Bettina, please click here. (5th June 2000) RAOUL HONORS TUI TUI, A CLOSE ALLY. The Republic of Raoul plans a special commemorative stamp, as well as festive banquetting, to honor the Archipelago of Tui Tui, a Fifth World country with whom we are on excellent terms. "The special commemorative stamp depicts Envoy Murgatroyd of Raoul with Co-Tyee Dogfish, esteemed joint-ruler of Tui Tui," said Madam Griselda, Minister of Internal Affairs, at a press conference in her office in Fleetwood's ritzy Pankhurst Street, today. The photograph of the pair was taken on the occasion of the Envoy's visit to Tui Tui recently, and features the Co-Tyee brandishing a postal datestamp, about to cancel a souvenir cover to mark the visit. Click here to read the special report on the Chadpex Stamp Exhibition, in Occussi-Ambeno.